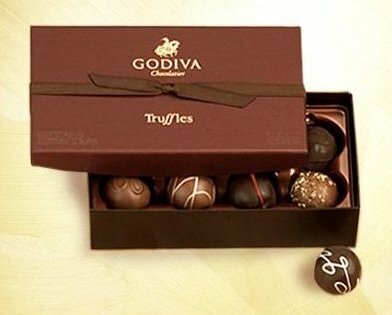 I am hungover from too many dark chocolate Godiva truffles* last night. That is not code for “vodka” either. I am a serious chocoholic, which sometimes makes for a rough next day of crashing. Today, the one thing keeping me upright at my desk is not wanting to look lazy in front of office mate responding to urgent work emails. It’s a nice distraction. Did I mention the fluorescent office light or the fire drills? Please, make the Reese’s Pieces jingle music stop. There are Kit Kats only a building away. Water is a good antidote, until I go to the lunchroom where boxes upon boxes of chocolate await my inspection. How I love romance writers! And hate them, too, for putting temptation in front of me day after day.